Instagram users will soon see this sample ad -- intended to give users a feel for how ads will be integrated into the app. 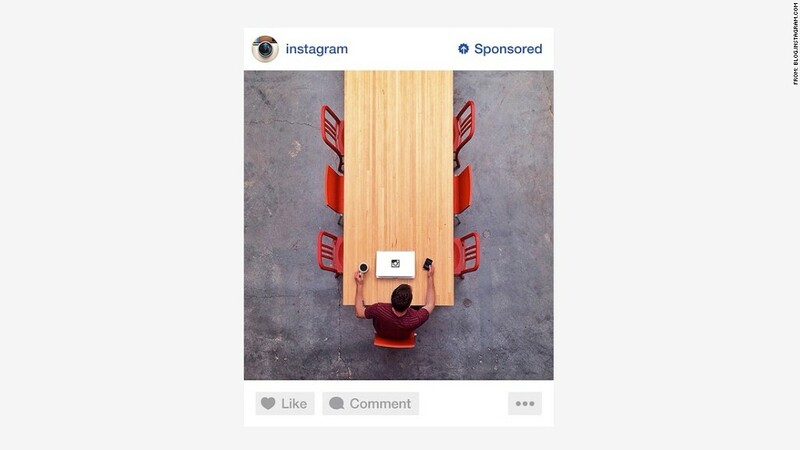 What do Instagram's new ads look like? Here's a clue: They look like Instagrams. The photo-sharing network Instagram on Thursday pulled back the curtain on a sample ad that will appear in users' feeds during the coming week. The ad, which looks much like a normal Instagram post, will carry a designation as "sponsored" content. The Facebook-owned app said that the first ads will come from companies that are already active Instagram users, including Adidas (ADDDF), Ben & Jerry's, Burberry (BBRYF), General Electric (GE), Levi's, Lexus, Macy's (M), Michael Kors, PayPal and Starwood Hotels (HOT). Instagram announced in early October that it would begin rolling out ads, but few details have been available until now. "We want ads to be creative and engaging," the company said in an announcement. "We want to show ads from businesses that are interesting to you." Instagram plans to tap into user activity in an effort to show more relevant ads. Users will be able to hide ads they aren't interested in, and have the option to provide feedback. Instagram now has about 150 million people on its network, continuing to grow after being acquired by Facebook (FB) for $1 billion in April 2012.